DET/Prop -- Oct. 21 EuroFest in Greenville.....fyi. VW featured marque. A reasonable target, to have "Cheap Thrills" ready for the Eurofest. I'll stand with the Ovlov crowd..... but will always have a soft spot for the C900. In my case, the BNE select mount moved with much less force with the spring mostly unloaded. Could it still be done loaded? Sure, anything is possible..... with enough leverage! Control the energy, and make it easy on yourself. 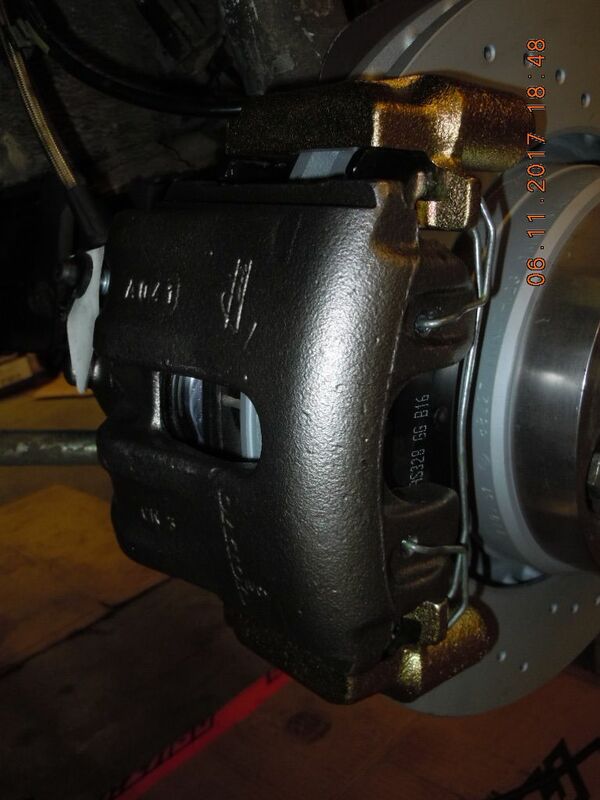 Regarding MORE CAMBER & CASTER being possible, I didn't find that to be true. My original modified stock mount (which I marked to the strut tower opening before removal) had MORE CAMBER than I was able to get in the set of slots with the BNE mount. Any adjustment you make is "bolt bound" at a point.... and I think I was there for the particular set of slots I chose. However while I lost a bit of camber, I gained a bit more caster. Calling it good enough until I get my FASTRAX installed to see what I got. I'll plan to document those measures with pics in this last hurrah thread for the 940. 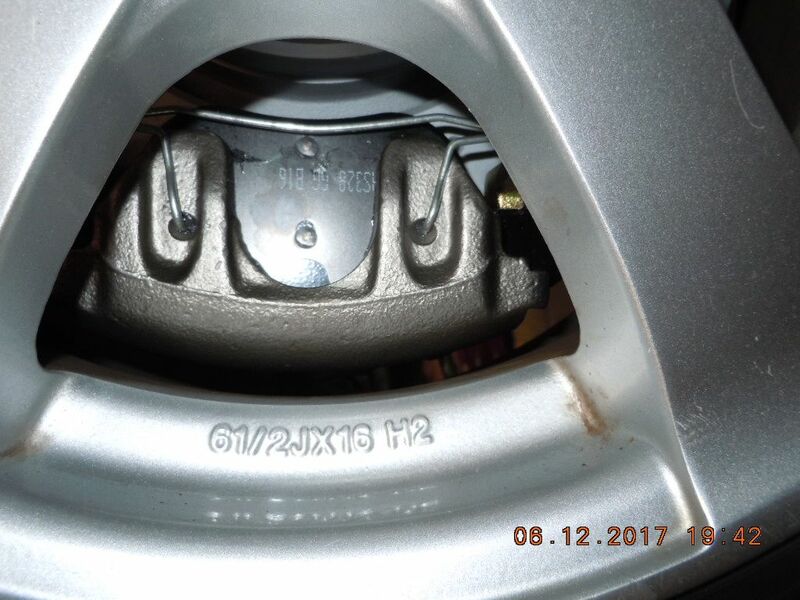 If the spring is pushing the strut mount into the strut tower that should be true but if you have the top strut nut fastened and the wheel off the ground, there shouldn't be any difference if the spring is constrained by spring compressors or a fully extended strut. 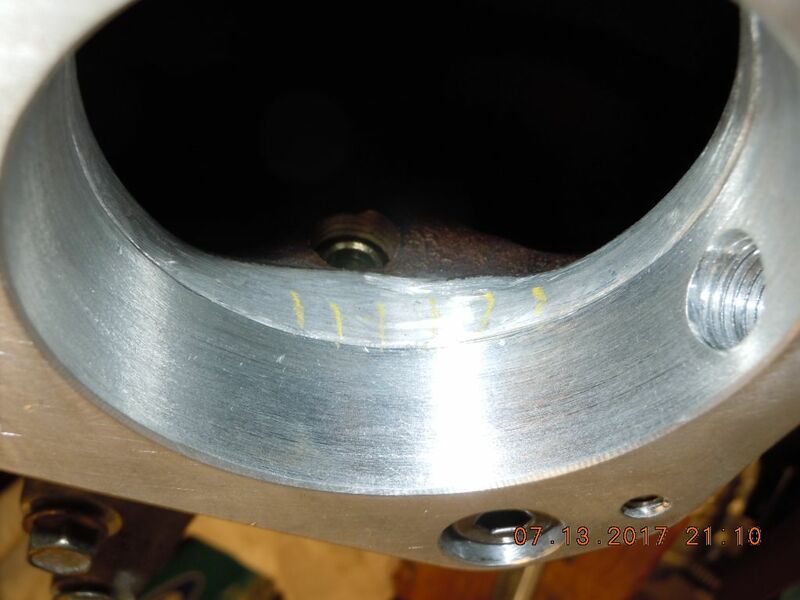 The mount has additional offset compared to a regular strut mount with evenly spaced studs, its possible to drill it unevenly which may translate to more? You could probably also use unevenly spaced bolts in the aluminum mounts as well to get a similar result. 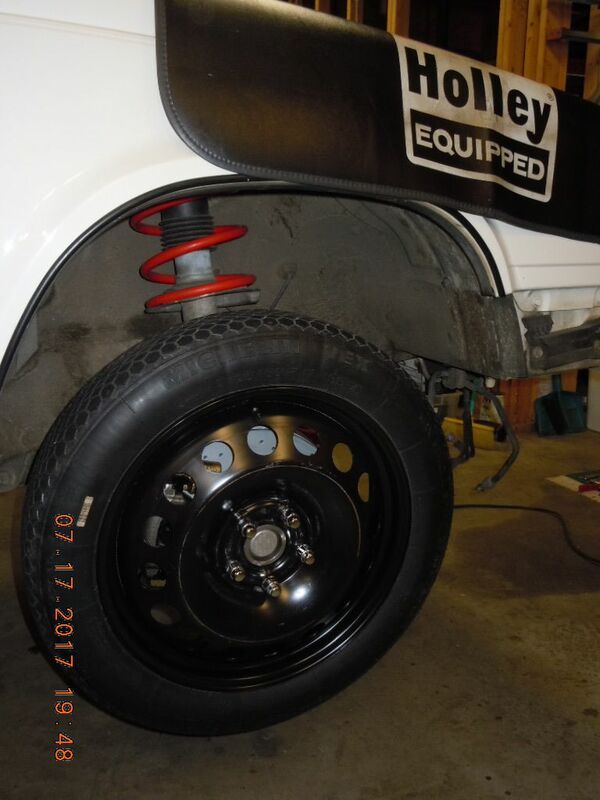 Naturally with the adjustment method the way it is, you will trade postive caster for negative camber. 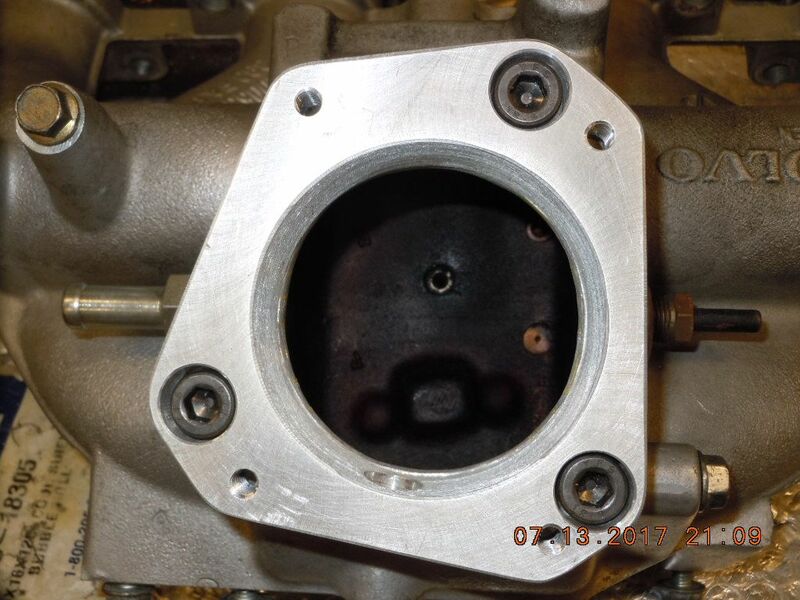 That's what happens when your strut tower opening is a circle instead of a square. 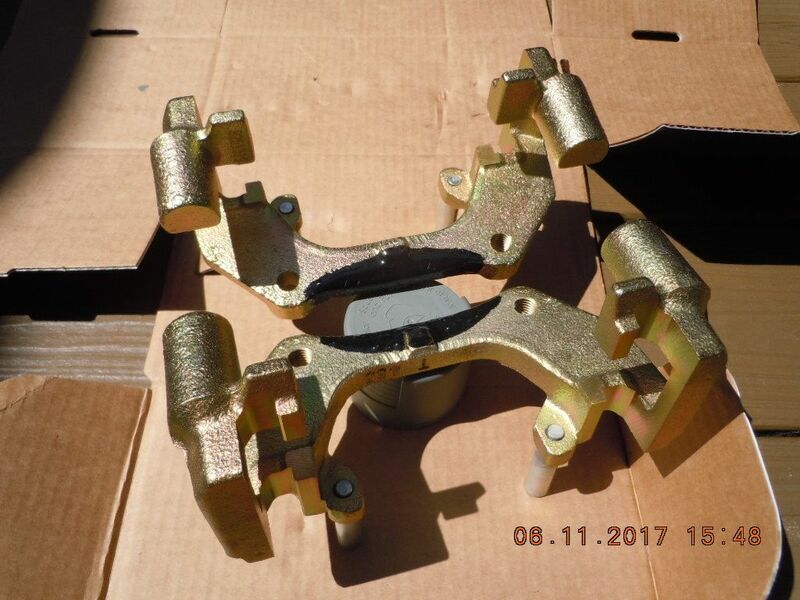 No matter how a strut mount is designed that will be the case unless you start cutting or settle for numbers achieved close to the center of the circle. The latter comment, not true with my B&G Progressive springs. Considerably taller than IPD sports (linear springs), even with the strut at full droop (sway bar disconnected and LCA inboard bolt "loose") the B&G is still under compression. For typical short "drop springs" and hack job cut OEMs, I'm sure your statement is correct. Its correct for both, when the strut is fully extended not bolted to car with a stock spring in place, where do you think that force is going? In the former case, the force was contained by the strut spring compressors, of course! but what about before the spring compressors are installed? 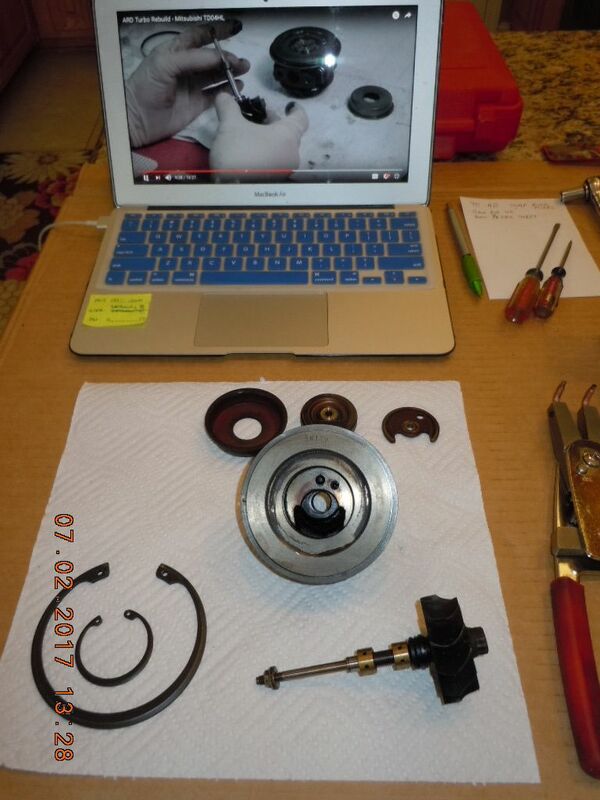 Well the all important fit check of wheel to spindle remained. 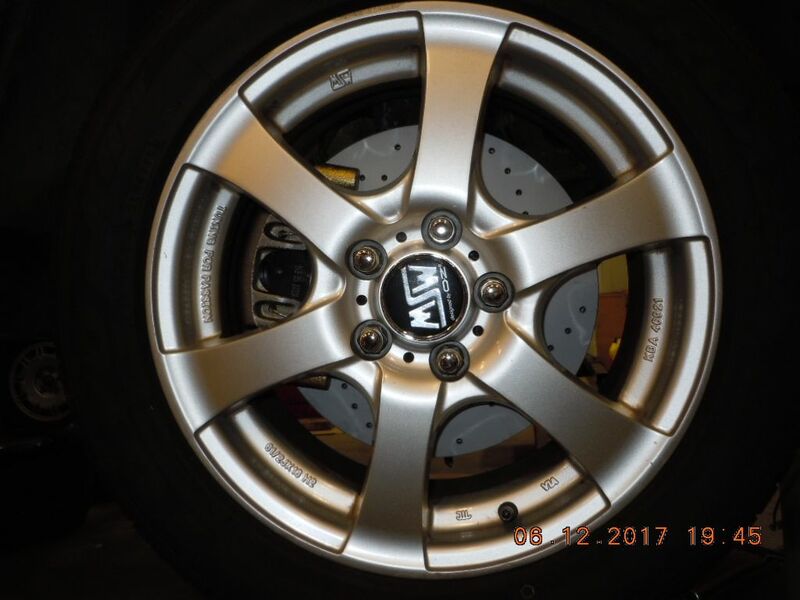 Since the 7/9s came factory with (as small as) 15" wheels, and the stock 280mm rotors, I presumed that the 302's would clear my 16" MSW wheels. The fit check confirmed they CLEAR, but not by a bunch! 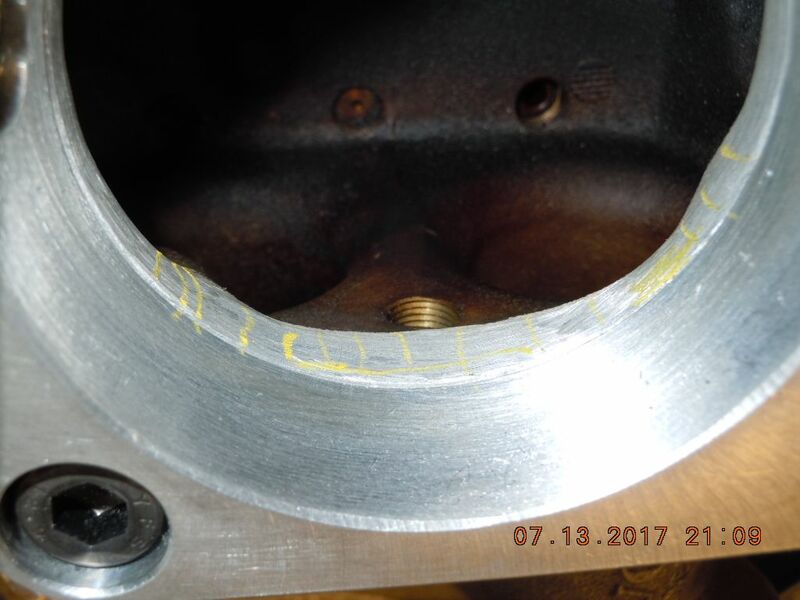 A little difficult to make out, but the clearance between the 850/C70/V70 caliper and the ID of the MSW wheel is around 6mm. I think the next standard disc rotor would be in the 320~325mm OD range.... definitely a NO GO for the 16 inch wheels. 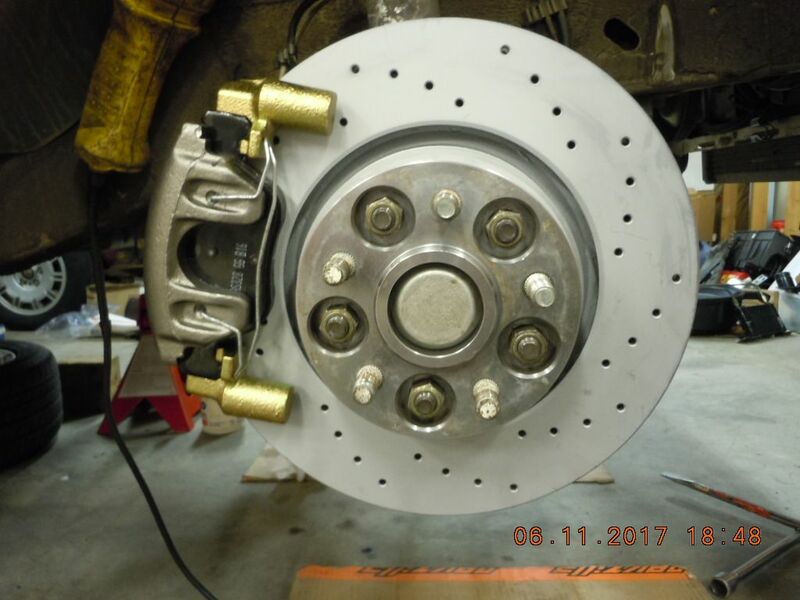 My 70 Chevelle Malibu is fitted with C5 brakes all around, and the fronts with 325mm rotors similarly just clear my 17" wheels on that machine. I'm pleased with the fitment..... you really can't run a bigger rotor setup and the 16" wheels. Those who have followed this thread will note I originally ran 17" Propus wheels, but I've stepped back to the 16" setup for reasons stated earlier. Brake bleeding will be out in the future, but I'm wrapping up the front brake work and hopefully moving into the other areas of my reconstruction (rear axle assy/LSD/fuel pump/rear subframe reinforcements). Not so cheap anymore, but pretty thrilling. Great build! 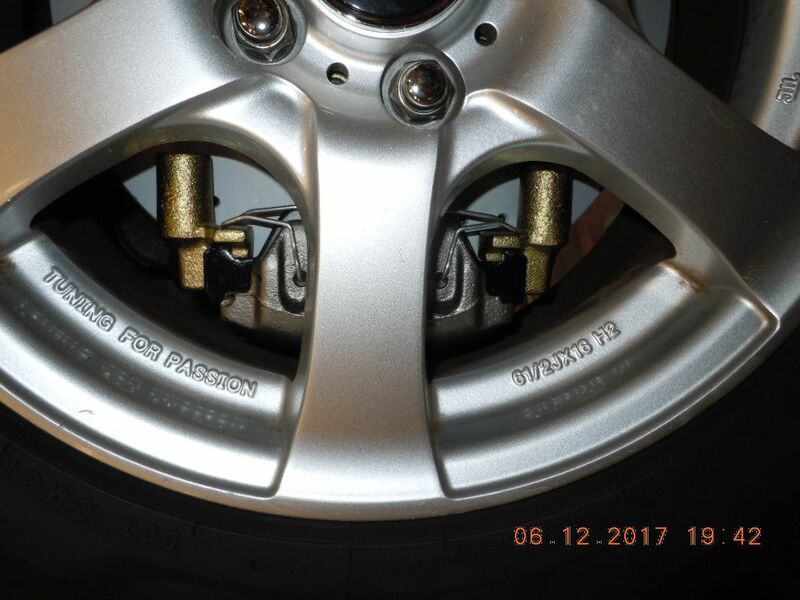 I'm looking forward to hearing how you like the big brakes. No good ever comes from adding up what you have in these types of projects. I can truthfully answer "I don't know." Well as a part of this "last hurrah" effort to the DD, I decided to replace the trusty old Garrett T3 with a Mitsubishi TD04 turbo. Having heard nothing but good about the 19t, I decided to rebuild/upgrade one myself just to get familiar with the secrets of the magic snail. Scored a 15g from a member here, then a complete Mitsu. factory overhaul kit, and finally bought the 19t upgrade package from ARD Tuning out in Oregon. The perfect time to perform automotive maintenance/upgrades on the kitchen granite counters is when the spouse is gone! Don't try this with her present, you will only regret it. You can see the Mitsu. 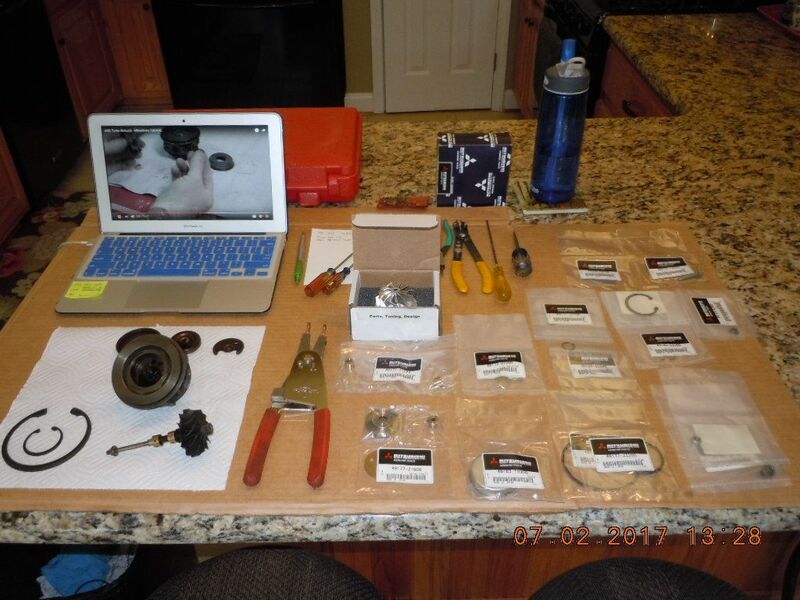 overhaul kit parts arranged as well as the ARD conversion 19t compressor wheel (no machining to the CHRA is required, they supply a matching compressor housing). 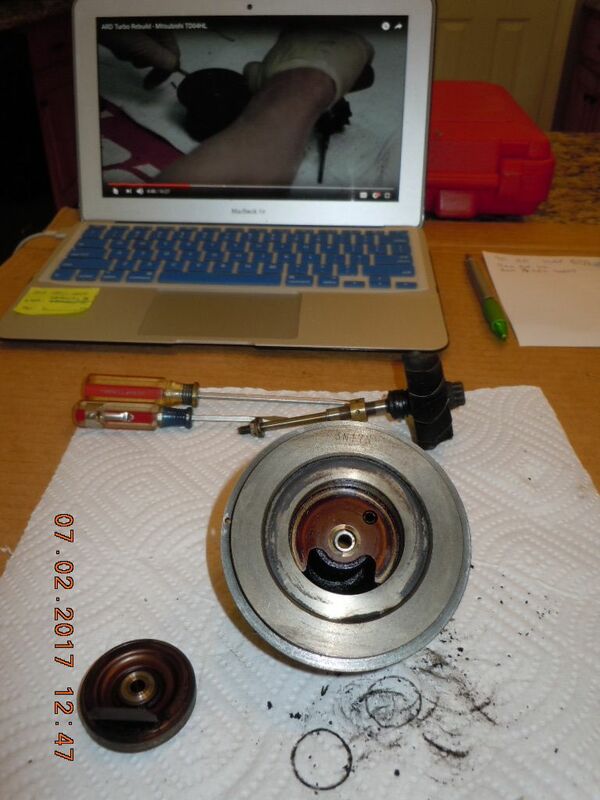 With the turbo completely disassembled and ready for cleaning of the CHRA housing, I boxed up the turbine wheel/shaft and the new ARD 19t compressor wheel, plus 2 other small thrust parts and shipped the entire works off to Midwest Turbo Service in Wisconsin for a proper balancing. ARD recommends this be done to ensure the longest life of the 19t. Parts hit the post office today, so I"ll be waiting a week plus while I figure out how to weld a 3" carbon steel V-band to my straight flange housing. Praying my machinist buddy can handle this one, or I'll be shipping that off to a welding shop. Did the rich AFR on boost issue ever get resolved? 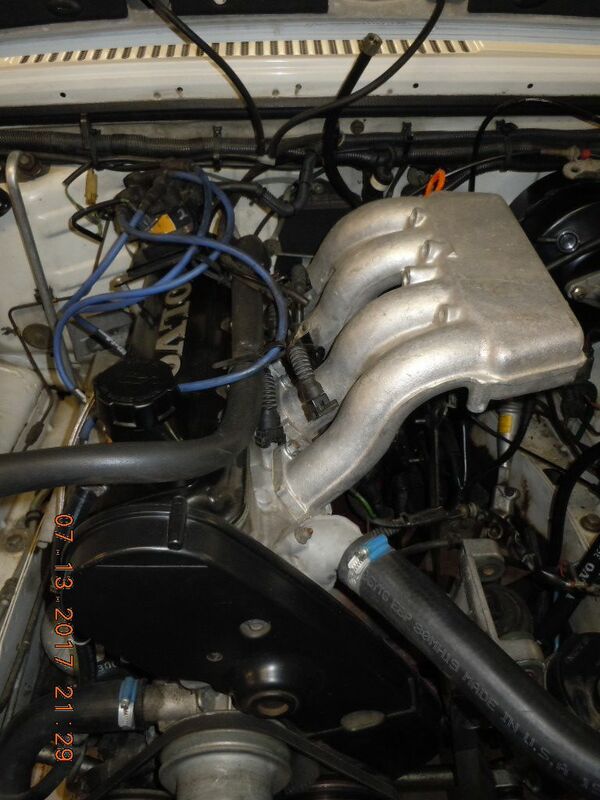 I am finding that my b230ft lh24 swap is 10 afr rich on my AEM under boost, it also has a rich idle, I'm thinking vacuum leak, but I haven't found much of a leak yet, at least not enough to cause my AFRs. There are 107 days left between now and Eurofest but it is very late today. While I ran the brown tops, I still had AFRs at 10 to 10.5. Searched high and low for leaks (as detailed long ago in this thread) and with TLAO chips I never could shake it. 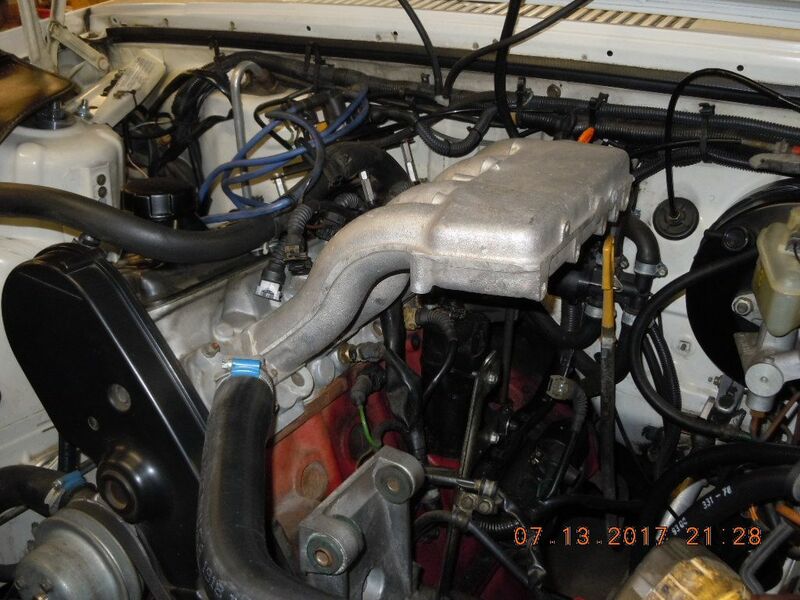 Actually went back to stock injectors about 1.5 years ago, and with those I was 11.5~12.0 at WOT with 16 psi. Mike repeatedly told me that his chips were designed to work with the 3" AMM and a 3" TB would help as well. I'm calling his cards with this last hurrah, as I'll have both of his suggestions in place. If it's still pig rich I'll be working with TurboTankShane to get some revised chips in my 984 ECU. We should plan a dinner meeting Friday night for all the TurboBricks crowd. Well, so be it, good luck chasing that down, I'm at my wits end with mine. I found mikes to be blowing smoke up multiple peoples asses with his chips. I had 8v ships for years and couldn't get brown tops to work well with 3" amm and then I went 16vt chips from him that never ran right. After a year of having them, he told me they were never really tested. Ditch those suckers and make your own. Uh, so, I went ahead and swapped out the reman MAF with a good used Bosch unit, and wouldn't you know, AFRs are perfect. If you have a spare MAF available, give that a lash for the richness. 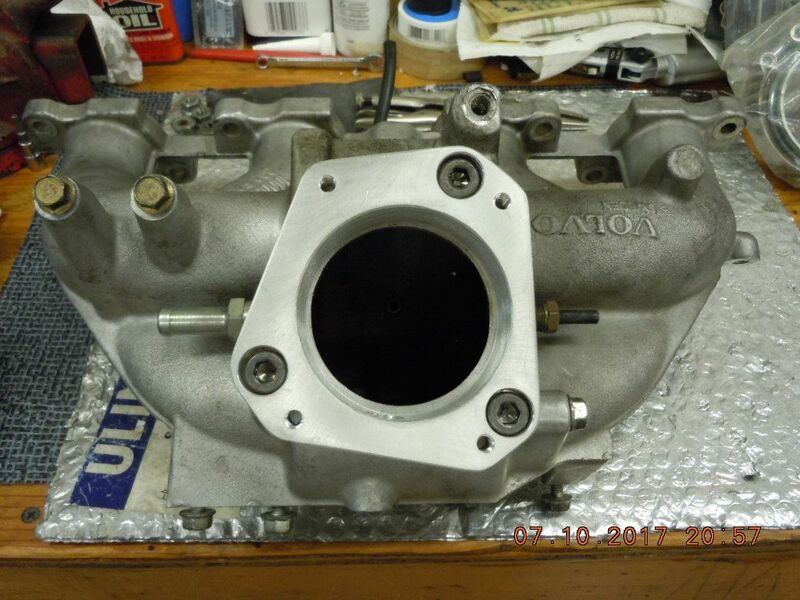 Back about 5 years ago, our recently departed Nathaninwa produced a conversion mount for attaching the 960 throttle body to a B230 intake. 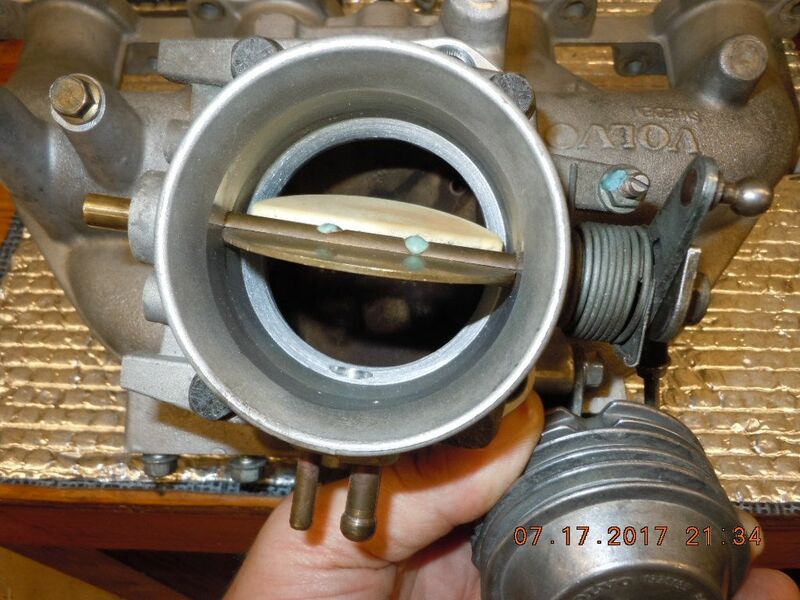 Real hotrodding sages claim that "while you CAN install too much AMM, you can never have too much throttle body". I've ready many a claim here that the stock 2.5 inch TB can become a choke point at increased power levels. When one of the original Nathan kits came up for sale, I decided to go to the larger 3 inch TB as part of the last hurrah effort. I'm going to need to get an aluminum cutting carbide bit. I understand a 20 tooth is what you want for porting aluminum; I've also read that ATF works pretty well to keep the tool clean. I might just try the dremel with a sanding drum first to see if it will remove this ridge around the B230 inlet. I scratched out a little "project time" last night, to port match the NIW 960 TB adapter. So far, so good. Shouldn't require that much more time to optimize the transition so the air flowing thru the 960 TB will have nice clean passage into the miniature plenum of my B230F intake. Over the last week I've perused the B21F intake threads in Performance. Glowing claims going back to around 2004 and continuing up to recent times, ALL of them praising this style of redblock 8 valve intake, the "best of the best OEM". Fabulous torque down low (they all claim) and a nice flat torque curve from 3K to 6K RPM. I've had a PM chat going with Barkster1971 over in the UK, who made this conversion to his 945 and loves it! Sadly, his pictures have been swallowed whole in the PhotoBugger nightmare. 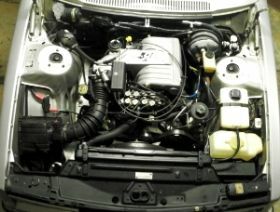 I'm unable to find a nice running example of such an intake in the 7/9 series, which has retained all the creature comforts I desire (cruise control, AW71 proper kickdown function). that the spare tire don't fit no more! Realized this as I installed the 302mm rotors and calipers. The OEM spare is a 15 inch rim, barely cleared the stocker 280mm rotors. Pulled one of these from a 2001 S80, never been on the road and the price is right ($12 out the door). 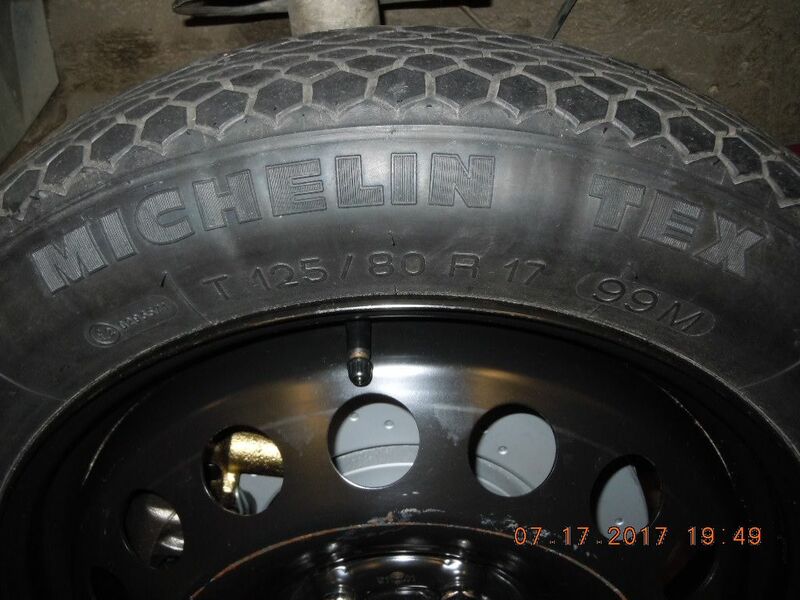 The 17 inch rim easily clears my front brakes, and probably would clear a 325mm setup as well (I'm thinking Willwood). So long as you are running FWD rims and spacers, the ET is correct. Problem solved. 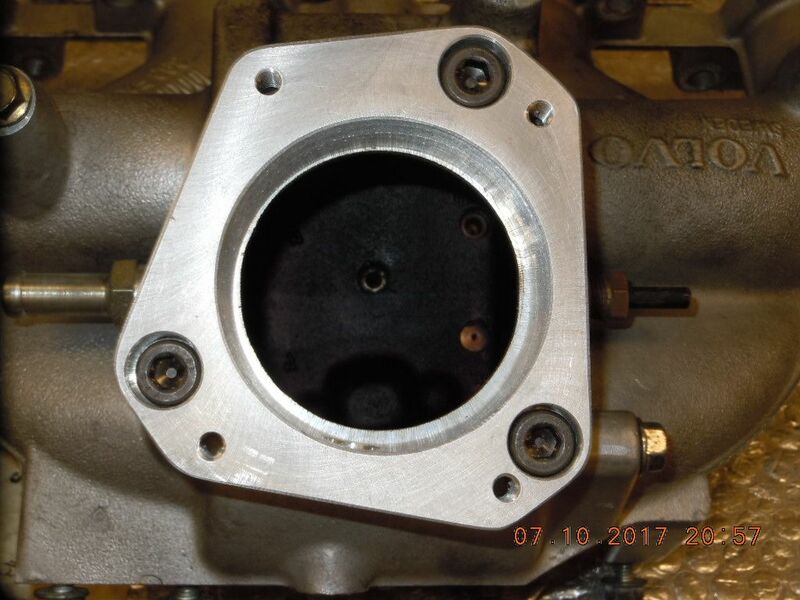 Finished the port matching of my 850 NA throttle body, and installed the NIW adapter for good (anaerobic sealant used, as the paper gasket would have been so thin after the porting the B230 intake it would have been useless). 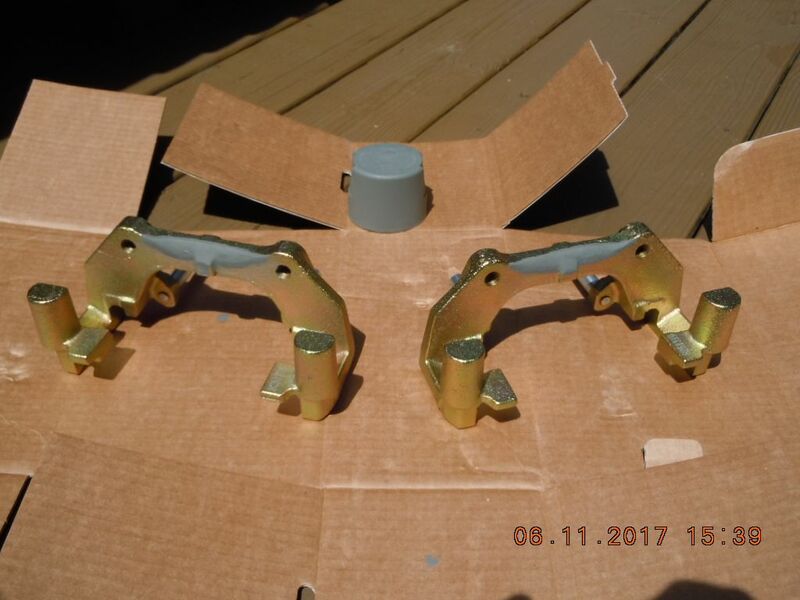 I also have kluged together a hybrid throttle lever, joining a K-Jet flat lever with the original 850 lever (to retain the throttle stop) to get proper actuation. The LH2.4 TPS mount has yet to be sorted, and likely will also be a PITA.... although DEK2688 might have a solution using a B234 throttle shaft. Also see if there's a convenient way to increase the lever on the throttle pedal end or the throttle body attachment point. Size shouldn't be the problem per se -- if there's an issue, it's modulation. You need a way to slow down how quickly it opens especially at low engine speeds, small throttle openings. Longer cable (more travel) may also be needed to assure full opening at a slower rate. A little experience with this when mine was 5.0L powered. Whoever hooked up the throttle linkage the first time put the throttle cable in the lower (shorter lever) hole on the throttle pedal end. This resulted in much quicker opening AND turned out the throttle was only opening about 60% of the way. I simply moved the cable to the upper (longer lever) hole on the pedal end --- modulation was MUCH better and now the throttle body was open all the way when the pedal was on the floor. 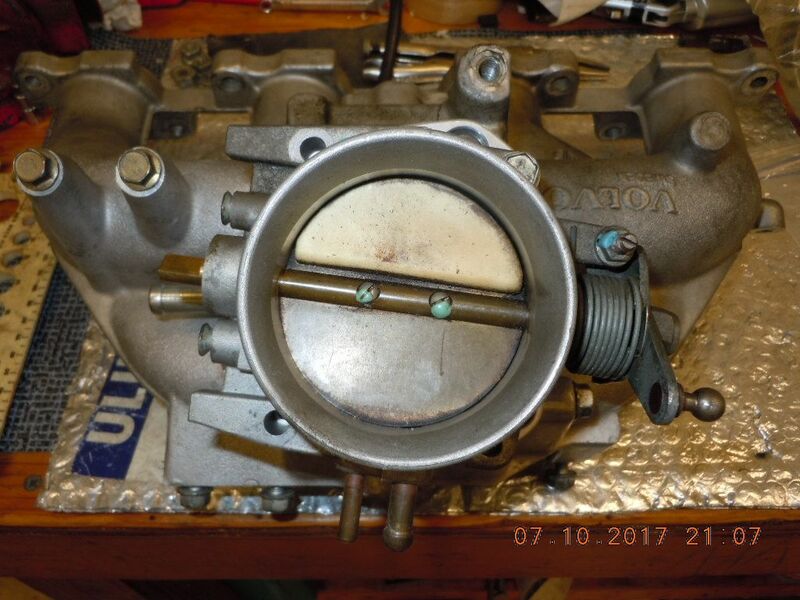 FWIW - an aftermarket 65mm throttle body with (at that time/mods) similar HP/torque to what you'll likely see on your modded motor, albeit, lots of torque at very low engine speeds. Factory/OEM style drivability.